Will Law Schools Have To Admit Almost Every Applicant? Will law schools soon have to admit almost everyone who applies? 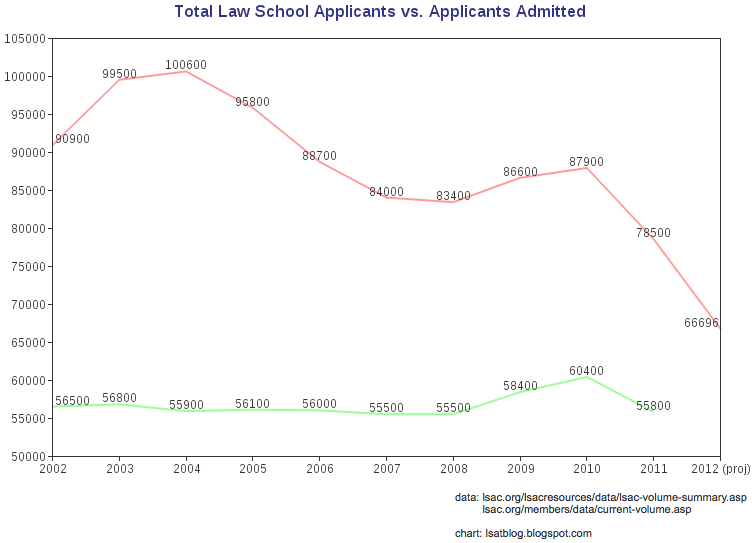 As the number of law school applicants has sharply decreased over the past 10 years, law schools have been forced to admit an increasing percentage of applicants. 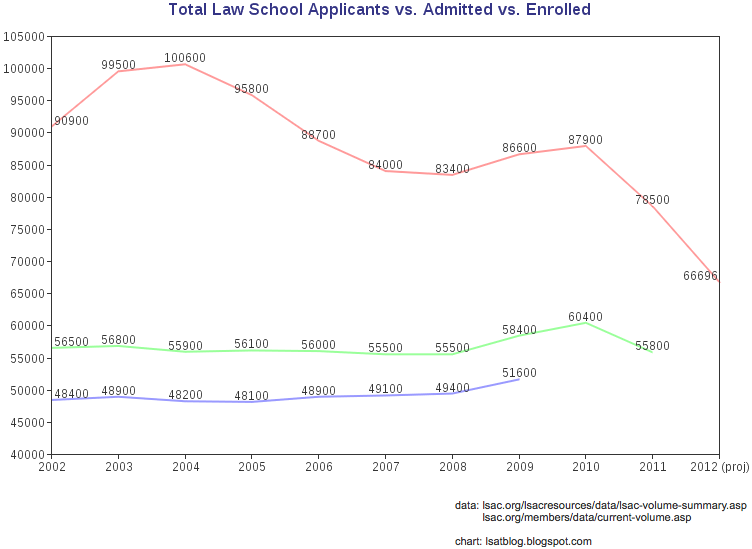 Here's the data from the Law School Admission Council demonstrating the increasing percentage of law school applicants admitted to at least one law school (shown in the graph to the top-right). Unless law schools shrink their class sizes significantly (and face serious decreases in the tuition money to which they've grown accustomed), they will have to accept the vast majority of applicants. 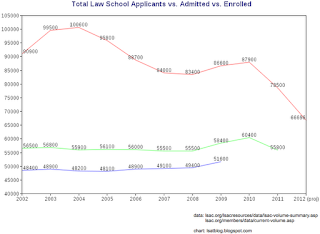 Unfortunately for them, the pool of law school applicants has significantly decreased in quality this cycle (with regard to applicants' LSAT scores). (See The Atlantic's take on this.) This will require many law schools to shrink their class sizes significantly or take applicants with LSAT scores (and perhaps GPAs) far lower than they'd like, harming their prestige and U.S. News rankings. 1. accept an absurdly-large percentage of applicants in order to maintain their normal class sizes. This will reduce LSAT and GPA medians, leading them to risk dropping in the U.S. News rankings. 2. accept fewer applicants and find ways to cut costs. I suspect that many law schools will have to do both - accept applicants that they previously wouldn't have (those with LSAT scores below their schools' traditional medians), yet still shrink their class sizes to some extent. 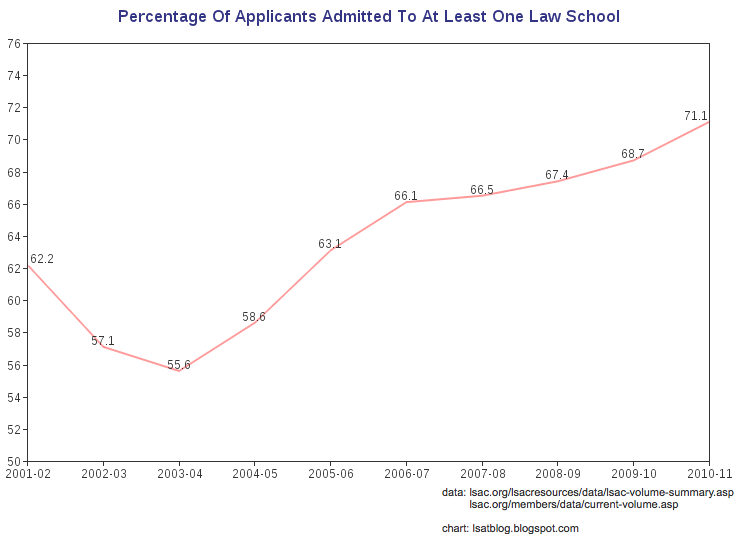 However, there's a serious problem when the number of law school applicants is this close to the number of applicants typically admitted - it creates a situation in which almost anyone can apply to law school and gain acceptance. While schools in the top 14 may still attract enough applicants to maintain something similar to their historical admission standards (high LSAT scores and GPAs), bottom-tier schools will have to resort to accepting applicants with extremely low LSAT scores and GPAs - students who may not be able to handle 1L classes, pass the bar, etc. If 4th-tier schools turn these students away, they risk not getting enough tuition dollars to meet expenses - tuition dollars upon which they're dependent for their daily operations. Let the belt-tightening and standard-lowering begin. Very little selectivity... no wonder there is a glut of lawyers! How will this affect acceptance rates next year? The implication is that this will cause acceptance rates to increase significantly in the cycle ending now. Since we haven't even seen LSAT #s for the 2012-13 cycle, it's really impossible to make any kind of prediction. However, I think it'll be quite some time before we see applicant numbers in the 80,000-90,000 range. Whether numbers fall further, stabilize, or increase (in moderation) for 2013 applicants will depend upon the economy, legal market, publicity related to the legal market, etc. How *Much* Easier to Gain Admission to Top-14 Law Schools? How do you see the trends affecting somebody who is planning on attending law school in four years?